There are, of course, thousands of places to see in Ireland, a country rich with history and natural beauty. We’ve put together, though, a varied list of places throughout the whole Island (including Northern Ireland), that together will give you a great experience of the Emerald Isle. 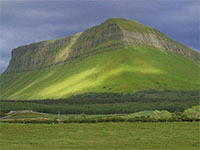 Ben Bulben, or Binn Ghulbain in Irish, is a large rock formation that dominates the Sligo landscape. It features in Irish history, mythology, and literature. It was formed during the ice age, when shifting glaciers shaped the plateau into its distinctive jaw like shape. The North Face of the mountain is blasted by Atlantic winds and is a difficult and dangerous climb, but the relatively sheltered South Face offers a popular walking/climbing destination, leading to spectacular views across county sligo and the Atlantic. Ben Bulben is perhaps most famous because of the poem Under Ben Bulben by William Butler Yeats, and is an important site for anyone following a Yeats themed visit to Sligo (known as Yeats Country). The closest town to Ben Bulben is Mullaghmore. The Giant’s Causeway, a natural wonder on the Antrim Coast, which mixes the landscape with the famous myth of Finn MacCool, is one of Northern Ireland’s most important tourist attractions. Over sixty million years ago, the Antrim coastline was subject to volcanic activity. The Causeway was formed as molten lava pushed to the surface, and variations in cooling led to the development of strangely symmetrical columns. The Giant’s Causeway is seen by more than a half a million visitors annually. It’s a must see on any trip to the North. The Causeway visitor’s centre, designed by the award winning Heneghan Peng, Architectural firm, is located close to the town of Bushmills (where they make the world-famous Whiskey). It can also be reached by Coleraine (with train connections to Belfast and Dublin). This is one of Ireland’s most famous natural sites, and one of its most popular tourist attractions. When you arrive here, and take the walkways along the cliffs, you feel very much on the edge of Europe / The World, as you gaze out onto the wild Atlantic ocean. The cliffs are 214metres at their highest point, and stretch for roughly 8km. 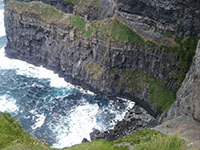 The Cliffs are close to Liscannor village, while Limerick is about 1.5 hours away. There is a visitor’s centre and a number of facilities at the Cliffs. You’re advised to allow roughly 2hours for a visit, and keep in mind that there are bus loads of tourists daily – particularly in the Summer months (or what counts for Summer, here in Ireland! Huntington Castle, built in 1625 to guard the strategic Dublin Wexford route, is today a wonderful country house with beautiful gardens. What makes it more special is the fact that, from the 1970s, it has housed the Temple of the Goddess which celebrates the divine feminine. Visitors on the Castle tour are shown the temple and given a guided tour of this fascinating and eclectic part of the Castle – there is the sacred well of St Brigid, a main altar as well as dozens of other side altars reflecting different goddesses and zodiac signs. 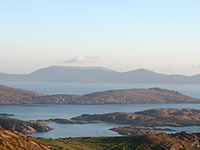 The Ring of Kerry, or the Iveragh Peninsula, is a 179km circular route that shows off some of Ireland’s most beautiful scenery, and includes sights like the Lakes of Killarney, Muckross House, the Gap of Dunloe and the Torc Waterfall. There are plenty of tours running from Killarney – though for the best experience you should take some time, and maybe make an overnight stay in Killorglin, Caherciveen or Kenmare. So far we’ve concentrated on natural sites, but what’s the bet that when you talk about your visit to Ireland, the first question will be: “did you visit Guinness?”. The black stuff, as this traditional stout is called locally, has almost become Ireland’s official trademark (though it’s now owned by a Multinational Giant), so any visit to Dublin is incomplete without a trip to the Brewery’s visitor centre. You’ll get a guided tour, be shown how to pull the perfect pint, and to top it all off you’ll get a great view over Dublin from the rooftop bar at St.James’s Gate. The Burren national park is a region of approx 250square km of Karst landscape, between the towns of Ballyvaughan, Kinvara, Tubber, Corofin, Kilfenora, and Lisdoonvarna. While seemingly barren and harsh, the Burren actually has a very moderate climate, and hosts a wide variety of rare plantlife – supporting arctic, mediterranean, and alpine plants side by side. The park also has more than 90 megalithic tombs, and the towns surrounding the Burren are amongst the most renowned for traditional Irish music. Just outside the town of Cashel, in the Golden Vale, lies the historic seat of the Kings of Munster. It is one of the most remarkable collections of Celtic art and medieval architecture to be found anywhere in Europe, with the main buildings dating back to the 12th and 13th century. The site is intimately tied to the story of St. Patrick. Legend has it that the rock, in reality an outcrop of limestone, was hurled here when St. Patrick evicted Satan from the nearby Devil’s Bit mountain (the mountain has a large gap, as if it had been bitten). The ruins include many well preserved examples of celtic crosses. The site is visited easily from Cashel. The Glens of Antrim consist of nine separate valleys (a glen is the word used in Scotland and Northern Ireland for a narrow valley) breaking up the Antrim Plateau. 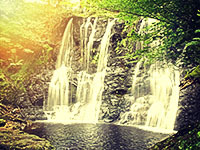 The whole area has been designated officially an area of outstanding beauty, and here you can find wonderful nature walks, beautiful forests, waterfalls and charming towns like Cushendall and Cushendun. In the summer Cushendall hosts an annual festival, the heart of the glens. Carrantuohill, at 1,038metres, in the Macgillycuddy’s Reeks, is Ireland’s highest mountain. The official Irish name is Corrán Tuathail, or Tuathail’s Sickle – but there’s plenty of debate about this, as the mountain’s name is not found in old Irish texts, and there have been various anglicisations in the meantime. The mountain doesn’t require any particular mountaineering equipment to scale, but caution is advised – particularly on the Devil’s Ladder section (as the name would suggest!). The usual route up the mountain starts from Lisleibane or Cronin’s Yard, about 25 minutes outside Killorglin. Skelig Michael has shot to international fame thanks to being featured in the Star Wars film The Force Awakens (not without controversy). This remote and tiny island, one of a group (the skelligs) off the coast of Kerry (reached by ferry from Portmagee), was a sanctuary for monks, founded sometime before the 8th Century (St. Fionan is said to have founded a monastery here in the 6th Century). Nowadays limited visitors are allowed on to Skelig Michael, which is a World Heritage Site. You need to go with an approved boat tour, and be aware that because this is a wild part of the coast, often weather conditions won’t permit trips – so plan accordingly. Emo Court, just outside the town of Emo in Laois, and near to Portarlington,is one of Ireland’s great country houses, designed by the architect James Gandon (who also designed the Four Courts and the Custom House in Dublin) in 1790 for the Earls of Portarlington. Emo Court is surrounded by 35 hectares of naturalistic landscaped grounds, with formal areas, woodland walks, many statues and a 20-acre lake – an feature of neoclassical landscape design . Croagh Patrick is one of Ireland’s most climbed mountains, in part because of the traditional pilgramage of reek sunday, which is held on the last sunday in July annualy. Croagh Patrick, or the Reek as it’s known locally, rises up from Westport (a must-see town in its own right), and is traditionally known as the place where St. Patrick fasted (for forty days and forty nights) before expelling all the snakes from Ireland! The reek has been a place of worship, though, from pagan times, particularly associated with the summer solstice. The visitor centre, at the foot of Croagh Patrick is about 8km outside Westport.